Robin Hobb’s Willful Princess boasts both horses and palace intrigue. This is the 199th in my series of Forgotten Books. I have reviewed nearly 200 books in this series since 2006. I have covered a lot of science fiction, mysteries and westerns, and some fantasy, but very little high fantasy. Not that I don’t like high fantasy. When the Ballantine Adult Fantasy books were being published, I bought many of them and discovered writers such as William Hope Hodgson, William Morris, and Joy Chant in that series — writers I still love today. I was already familiar with the names of Clark Ashton Smith and Lord Dunsany but had not read them, I read a lot of high fantasy and, as the market exploded, I burnt out on it quite spectacularly. But I kept returning on occasion, I read The Belgariad of David Eddings and enjoyed it. But the subsequent volumes did not have the same sparkle and newness. The Wheel of Time? I read six volumes and realized that the story was advancing at the rate of about a week per 500 pages. And I no longer cared. So, in 1995 when Robin Hobb appeared with Assassin’s Apprentice I was like, OK, yeah, yeah, more of the same. At least until I read that novel. After that, I was hooked. Then I found out that Robin Hobb was a name used by Megan Lindholm. I had read The Wizard of the Pigeons and Cloven Hooves and enjoyed those urban fantasies, but her Robin Hobb books were big, fun high fantasy thrills. So, I became a Robin Hobb collector. I have the British hardcovers of all but a couple of the Live Ship Traders sequence. I will get to them eventually. In my mail today (and this is an absolutely true story) was a limited, signed printing of the Assassin’s Fate, the latest novel from England. I knew it was coming, but hadn’t expected its arrival just yet. So the other day, I needed a new book to read and review. I had started a couple of titles but only managed to read 15 or 20 pages a night. I was working in the library, moving around some books that were catching morning sunlight and replacing them with titles where a little sun bleaching was not going to be a financial loss. 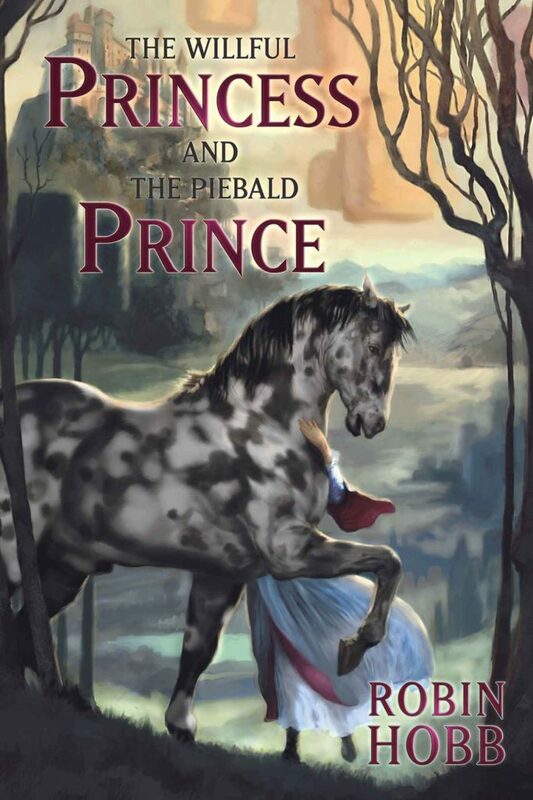 One of those titles was The Willful Princess and the Piebald Prince. I looked at it. It was short, 154 pages, as opposed to the massive novels she now writes. It was a stand-alone too, a prequel to the first Farseer trilogy. And, did I mention it was short? I grabbed a spot in my reading chair and turned on some ’60s music to let the magic take me away. And it did. The book is two novellas with a common narrator, Felicity, whose mother was the wet nurse to Princess Caution Farseer, the only child of King Virile and Queen Capable Fareseer. Felicity is a couple of years older than Princess Caution and was the young princess’ first companion/servant. Felicity’s mother filled her mind with scheme’s to make sure that she improved her own and the family’s position at court. The princess is known to be willful, but as an only child, her parents are not to deny her anything. Felicity remained her close and only companion. As the princess began to age, she was trained in the intricacies of political diplomacy and intrigue. But, she needs to marry and produce an heir. But no one presented to her attracts her attention. This escalates when she is named Queen-in-Waiting. Her only passion is riding in the hunt. One Spring, she decides to go to the Horse Fair at the market and sees an amazing piebald-colored horse being handled by a piebald-colored hostler, named Lostler. There is an instant attraction to the animal and his handler. There are rumors that Lostler has some of the Wit, the ability to merge with an animal and see through its eyes. The Spotted Stud becomes the dominant horse in the stables as does his handler, replacing the stable master almost immediately. The Spotted Stud has its way with the mares around the castle and soon, the hostler does the same with the princess. Where the Spotted Stud breeds spotted progeny, so it is with the princess, who has not heeded her name. Her spotted son ends up being the cause of her death and soon becomes the heir to the throne. The princess and her mother soon die, leaving a grieving broken king who muct choose between his less-than-noble grandson and his brother’s son, Canny. Deadly political intrigue and the promotion of family interests worthy of Game of Thrones begins in the second half of the book. Those who are tired of waiting for the next GRRM novel can easily quell some of their thirst with the tales of the Farseers, which now number 21 titles. Check them out if you want a high fantasy fix. If that’s not your bag, check back next week and we will see what new book I have for you.